And welcome to your new (or your first!) issue of Dream Home Decorating News. This month's issue is London-themed, with DIY ideas for parties, walls, and creative 'room jewelry'. Enjoy! OMG - It's The Jubilee! Britain is celebrating! Her Majesty Queen Elizabeth II (a.k.a. The Queen ) was only 25 years old when she succeeded her father, King George VI (as seen in The King's Speech ) to the throne. 60 years later, we're celebrating her Diamond Jubilee with street parties up and down the country, and on Sunday with a Jubilee Pageant on the River Thames (covered live by the BBC in many parts of the world). 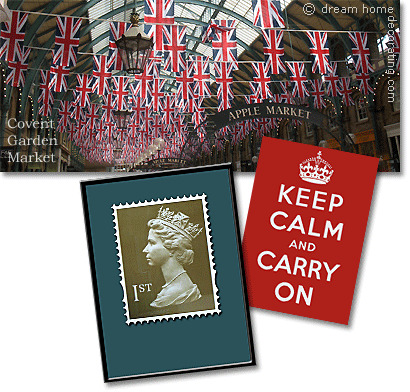 So here are my post cards to you: somewhat patriotic DIY ideas and fun decorating tips, from London with love. Enjoy! At the moment, our public places and shop windows are all covered in Union Jacks and Queenalia. Think car-driving corgis and tiny solar-powered, pink-clad Queen figures doing a very realistic royal wave. ... but I'm even more impressed with the creative handmade bunting. ♦ an Andy Warhol style portrait of the Queen with the caption 'E♥R' (Elizabeth Regina). All these ideas can of course be translated into any other nationality! ♦ you could play around with the actual design of your flag and create color and pattern variations. For the red-and-white stripes, I used some of the wonderful vintage French ticking my friend Wendy Lewis sells in her online shop. And the blue ground for the white stars could just be made from cast-off denims. This card shows two pics I shot at Selfridges last week. Most people have a lonely clock hanging somewhere in their home, but I think there's wonderful scope in clustering large and small clocks, particularly if you have friends or family in other time zones! The other photo shows a lovely collection of tightly hung, 'shabby' picture frames. Even with frames in different colors and sizes, you can create a sense of unity by using pictures in a similar style and color scheme, like black-and-white photos, sepia prints or drawings. I found this great little shop full of custom-made colorful upholstery and tactile, fabric-covered accessories in Shoreditch (East London). You can commission a gorgeous piece of furniture from Squint Ltd, but just looking at their work can give you loads of inspiration to create your own pieces out of fabric, glue, and something old with good bones. For example, when you look closely at these 'sweetwrapper' chandeliers, you can see that the fabric wrappers are actually quite coarsely done. You could gussy up an inexpensive chandelier in this style and create a personalized, one-off piece of room jewelry! See how they've covered even the 'candles' in fabric - alternatively, you could go for a mix of painting and fabric 'découpage' to save yourself time. Endless possibilities! And that's it for this time! Have a lovely summer (or a nice rainy winter, Down Under) - and 'see' you again on August 1, 2012!